White plastic Small Phthalate and PVC free eraser, for extra clean and smooth erasing of blacklead pencils ..
Staedtler Glasochrom Chinagraph box 10pc. Wood-cased pencil in 6 colours. Waterproof. Ideal tool for users in industry and trade . For use on glass and smooth surfaces, e.g. glass, leather, metal, wood and plastic . For opaque marking even on dark and transparent surfaces . No bleedin..
Staedtler Glasochrom Chinagraph ea. Wood-cased pencil in 6 colours. Waterproof. Ideal tool for users in industry and trade . best on glass and other smooth surfaces, e.g. glass, leather, metal, wood and plastic . For opaque marking even on dark and transparent surfaces . 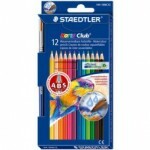 No bleeding t..
Staedtler Clutch Leads 2mm 12pc. 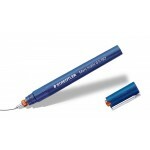 Made up of over 90%, carefully-selected, natural raw materials and manufactured in a unique, ecological production process - no PVC and no softening agents - the mechanical pencil leads offer users a soft, smooth-gliding writing performance and, thanks to their ..
Staedtler Clutch Leads Mars Micro. 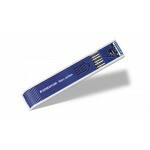 Select from the various sizes and grades. 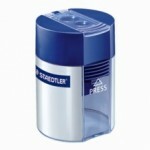 ..
sharpener, staedtler double hole with barrel shavings catcher, good quality metal blade ..
Staedtler Mars Lumograph 100 Pencils (Blue) box 12pc. 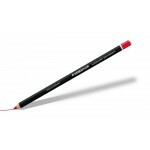 The formula is secret – the pencil is world-famous!. 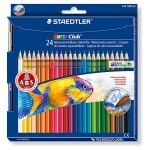 It was with pencils that STAEDTLER's success story began. To this very day, first-class materials and manufacturing processes guarantee outstanding and unbeatable product quality. ST.. Replacement cones . 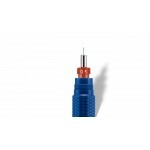 Mars Matic Technical Pens cones available in 1.00mm, 0.7mm, 0.5mm, 0.35mm, 0.25mm, 0.18mm & 0.13mm. Please specify size required in the comments section ..
Mars Matic Technical Pens complete available in 1.00mm, 0.7mm, 0.5mm, 0.35mm, 0.25mm, 0.18mm & 0.13mm . 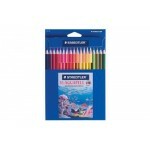 Please specify size required in the comments section ..
Water Soluble Pencils - 14410NC12 - Set of 12 assorted . Coloured pencil in classic hexagonal shape with watercolour lead . Offers a wide range of colouring possibilities - also with water and brush . A·B·S - the white protective coating reinforces the lead core and increases break-resis..
Water Soluble Pencils - 14410NC24 - Set of 24 assorted . Coloured pencil in classic hexagonal shape with watercolour lead . Offers a wide range of colouring possibilities - also with water and brush . A·B·S - the white protective coating reinforces the lead core and increases break-resis..
Water Soluble Pencils - 14410NC36 - Set of 36 assorted . Coloured pencil in classic hexagonal shape with watercolour lead . Offers a wide range of colouring possibilities - also with water and brush . A·B·S - the white protective coating reinforces the lead core and increases break-resis..
Noris Club col pencils - 144NC12 - 12pc . Coloured pencil in classic hexagonal shape . A·B·S - the white protective coating reinforces the lead core and increases break-resistance . Especially soft and richly coloured lead . Up to 36 brilliant colours . Wood from certified, sustainabl..
Noris Club col pencils - 144NC24 - 24pc . Coloured pencil in classic hexagonal shape . A·B·S - the white protective coating reinforces the lead core and increases break-resistance . Especially soft and richly coloured lead . Up to 36 brilliant colours . 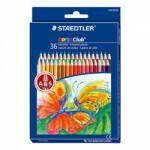 Wood from certified, sustainabl..
Noris Club coloured pencils - 144NC36 - 36pc. Coloured pencil in classic hexagonal shape. A·B·S - the white protective coating reinforces the lead core and increases break-resistance. Especially soft and richly coloured lead. Up to 36 brilliant colours. Wood from certified, sustainably managed fores..
Learners Maxi - Assorted - 10pc . A·B·S - the white protective coating reinforces the lead core and increases break-resistance . 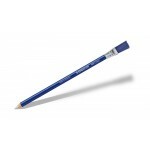 Specially designed for small hands, ideal for first drawing and colouring . Break-resistant thanks to super-bonded lead . Easy to sharpen . 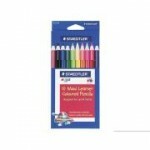 Conforms to EN 7..
Staedtler Noris Club Maxi Learners 12610pc box single colours or Wallet of 10 colours. Jumbo-sized 12-sided coloured pencils. 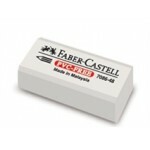 The white A·B·S coating protects the lead which makes the pen up to 30 % stronger. 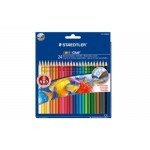 Specially designed for small hands, ideal for first drawing and colouring. 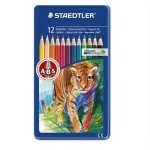 Break-resistant ..
Staedtler Noris Maxi Pencils 10pc. Jumbo-sized 12-sided soft graphite pencils. 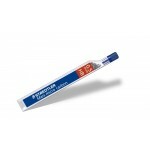 The white ABS coating protects the lead which makes the pen up to 30 % stronger. Specially designed for small hands, ideal for first drawing and colouring. Break-resistant due to super-bonded lead. Easy to sharpen. The pe..
Staedtler Noris Maxi Graphite Pencils ea. Jumbo sized 12 sided pencils especially designed for use by small children. Break-resistant thanks to super-bonded lead. Easy to erase and sharpen. Available in 2 degrees: 2B and 6B ..
Mars 526 61 Rasor Pencil with Brush also suitable for ballpoint pen, writing and drawing inks For pinpoint erasing With brush Phthalate and latex free ..